Average Weight	: 45 - 55 lbs. The Pharaoh Hound is one of the oldest domesticated dog breeds in the world. The breed is estimated to have originated around 4000 to 3000 BC. It is believed the Pharaoh hound was bred from a wild dog-perhaps the jackal and another type of dog from the Middle Eastern region. Evidence of dogs in the Mid-East have been found as far back as 11,000 years and the recorded evidence of these dogs as companions of the Pharaohs can be found on tomb walls over 4,000 years old. Artworks in the tombs of Egypt depict a dog that looks very much like the Pharaoh. It seems likely this hound was bred to hunt for small game as a scent and sight hound. They were also bred to remain calm and be good companions to royalty when they were on the hunt or sitting in the throne room. The breed is very popular on the Mediterranean Island of Malta and is used for hunting rabbits among ancient ruins with the help of ferrets. Pharaoh Hounds are even featured on the national coins as a symbol. The Pharaoh was brought the United Kingdom and the United States in the 1960s and were accepted into the American Kennel Club just 20 years later. There are still very few dogs anywhere other than Malta. When excited this breed 'blushes": turning a deep pink/rose on it's nose and ears. Good with other dogs, but can be dominant towards other male dogs. Loves to chase, and is fast...........so not good around smaller dogs it sees as prey. Cannot be trusted with rabbits, cats, pet rodents and other non-canine pets. Needs to be leashed, as a runner will take off into traffic. These dogs are as imperious as their regal background would suggest, though quite loving in their own way. 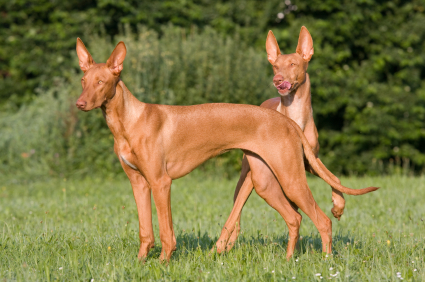 They are good with families and other dogs, though smaller critters should beware since the Pharaoh Hound has been bred to go after small vermin for thousands of years. Pharaohs are very intelligent dogs. They often seem to be mulling over whether they agree with your instructions, even when well trained. As such, successful training programs will take the Pharaoh's unique temperament into consideration. These dogs were also bred to be semi-independent operators and will very happily range at quite a distance from you. When you very gently assert your role as leader from an early age, and there's no reason for your dog to distrust you, they will readily accept you as the alpha. Other members of the "pack" may also give commands, but you'll need to make sure the rest of your family members are consistent with commands. Generally the Pharaoh wants to make his or her own decisions and may very well decide to simply ignore your instructions if they seem stupid to the dog. They are very capable of learning basic obedience and when trained, are among the best field trial dogs. Like many hounds and other dogs with a particularly good sense of smell, the Pharaoh Hound will very often bolt after any scent that catches their nose. This means that off-leash activities are generally limited to areas that are well fenced. They are very rarely aggressive animals and can be counted on to behave themselves around most other dogs when properly socialized from an early age with other dogs. The only exceptions to this are alpha-male dogs that want to challenge the Pharaoh. Dogs that are not socialized can be come neurotic and fearfully aggressive. However, cats should never be trusted around the young Pharaoh Hound. Older dogs that have been raised with a cat are probably o.k., but for the first year or two your dog may simply forget they know the cat, only to feel very badly for killing it with one snap when you weren't looking. Since the breed is not very common or particularly popular, they have very few congenital Health Problems that are common for other purebred dogs. A good breeder should be able to Show you the lineage of the dogs you have and prove the parents are in good Health. Most Pharaoh Hounds have Chemical sensitivity and are very sensitive to chemicals, especially insecticides such as those used to treat fleas. The grooming for this very shorthaired dog is very simple, since they don't even need a combing unless you're trying to get something very specific out of their hair. Usually all that's required for coat maintenance is a weekly rub with a rough rag, sometimes called a hound cloth. They also enjoy a good rubbing with a rubber brush to massage the skin and remove dead hair, though this could easily be a monthly task. There is no need for a groomer otherwise, since the hair is continually shed. Though they do shed tiny hairs continually, there is a mid-spring and early autumn shedding events that may result in your dog being a bit colder than usual since they can go nearly bald for the summer. The Pharaoh hound absolutely requires a great deal of exercise every day, otherwise they get very anxious and their already frequent barking may become excessive. While walks certainly are helpful and a nice activity for you and your Pharaoh Hound, they really need some nice, hard running to be happy and to expend the energy that makes them such effective small-game hunters. Running alongside a bicycle is an especially good option for city dwellers. It may actually be more of a chore to keep your Pharaoh reigned in if you live in a rural area, since they are very capable of jumping most common fences. To contain them, you should consider a fence that's at least 8 feet tall. They are also capable of taking off after just about any scent that interests their very keen noses and should usually not be let off the leash when roaming in natural areas, as they can take off and not bother coming back for a very long time or ever. However, urban and suburban living may actually work out better for the Pharaoh, as far as exercise is concerned. A very good activity for these dogs is running around in a fenced, off-leash area of a park. This allows them to be engaged with other dogs. They are also distracted from just hopping out the fence and into the parts of the park where they're not allowed. The Pharaoh Hound requires some careful training while young to grow into a well-socialized animal that follows even the most rudimentary of commands. The keys to the Pharaoh's training are positive reinforcement and consistency. For most dog owners, the first concern is how well the Pharaoh takes to housebreaking. Thankfully they do fairly well with this if you are around to take cues from the puppy and get them outside when they show any inkling of having to go. When they do well they should be praised. Never punish a Pharaoh (or any other dog for that matter) unless you actually catch them in the act, since they'll forget what they've just done moments after doing it. It is vitally important that you give puppies a chance to interact with as many different people and dogs as possible when they're young so they get used to new situations. Otherwise your dog may become fearfully timid. Obedience training can be a bit more challenging, simply because the dog may not see any reason for it. In this case, repetition is key. Don't get frustrated and be sure to always use the same commands. They may not seem to get it, but they probably do-it's a matter of will for many Pharaoh hound puppies. The biggest challenge for most Pharaoh owners will be their barking. They just seem to enjoy barking, and will do it nearly incessantly unless they receive some very firm and consistent guidance from you. Even a well-trained Pharaoh hound will probably still continue to bark more than many other breeds. Some people have successfully used a bark collar that either delivers a shock or a citronella burst, though the effectiveness of these punitive tools has varying levels of success with this breed. It will probably be impossible to train a Pharaoh hound not to chase small creatures, though if you have a cat, you'll have to make a special effort to socialize them with the cat from an early age and not give them a chance to. One of the most convenient trait of the breed, as far as training is concerned is their ability to return when called from a very early age. From this easy success you should have a very firm foundation to build further training successes upon.